I was raised in south and north america. In my teens I was involved in environmental, social justice and feminist groups. In my 20s I studied hairstyling and holistic health and spirituality. 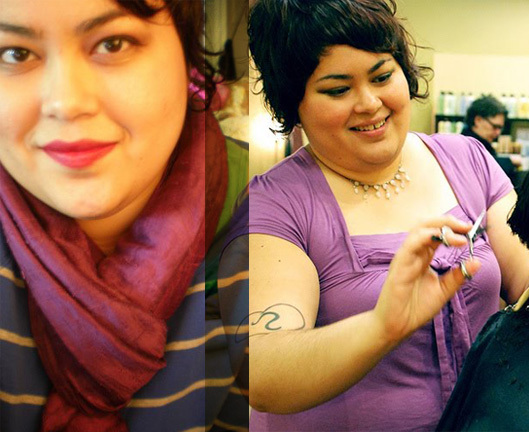 In my 30s I am able to unite my loves as a hairstylist at Clover Earthkind Hair Salon. I realized I enjoyed cutting hair when I was 20 and was living in a punk feminist communal household. What made me fall in love with hairstyling was being able to help people feel their best through their hair. I love my clients! I love that I have a profession that enables me to be part of community and part of peoples lives. I love the friendships that I have developed through my work. I love that I work at a salon that has the highest environmental standards in the industry. We divert 98% of the waste created at the salon through an extensive recycling and composting program. We have a strict no animal testing policy, which means that all the products we use are animal cruelty free. No harsh chemical services like perming or chemical straightening are permitted in the salon and the number one colour line used in the salon is ammonia free. This makes for a breathable environment. You can read more about our environmental policy here. about the products she uses on my hair. Can't wait for my next cut and colour!" knows how to best do my hair. Thanks Andrea! I've loved every cut you've given me!" Copyright © 2019 MagentaRays . All Rights Reserved.